The first exhibition in Italy to be dedicated exclusively to the theme, this offers a fascinating insight into both the history of art and the history of science. What is a globe? A depiction of the earth or the heavens by means of a painted or printed spherical surface. From the days of Antiquity, the history of such depictions is closely bound up with the history of astronomy, an area of enquiry which ultimately – thanks to contributions made by such figures as Copernicus (1473-1543), Kepler (1571-1630), Galileo (1564-1642) and Newton (1643-1727) – would see the emergence of modern scientific thought. The period of their writings was also the beginning of a Golden Age for the production of terrestrial globes. First in Holland – thanks to the great printers and publishers, Hondius and Blaeu – then in Germany, Italy, France and England, both terrestrial and celestial globes became of increasing importance during the course of the seventeenth century. From being practical aids to study and teaching, these spheres became richly-ornamented objects. 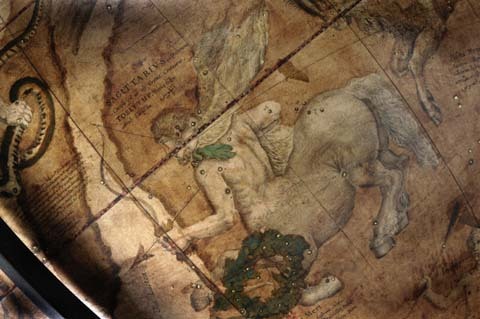 Famous painters and engravers depicted the constellations on celestial globes, with decorated scrolls being used to fill in the as-yet unexplored areas of the world. Elaborate spheres in precious metals adorned the Wunderkammern of the day, whilst globes of notable size were also produced; those which the Venetian Vincenzo Coronelli created in 1683 for Louis XIV’s palace at Versailles quickly attracted attention as the largest such objects ever produced. The exhibition opens with a tribute to this same Coronelli (1650-1718). A geographer, cartographer, inventor and printer, the Venetian friar can justly be considered one of the most famous globe makers of the 17th century. A combination of scientific instrument and marvellously-inventive machine, the globes he created were to be found in the libraries of scholars, princes and monasteries, usually in pairs (one terrestrial, one celestial). The first showcase contains a rare copy of the second edition (1704/1707) of Coronelli’s Grande libro dei globi, followed by a pair of celestial and terrestrial globes (cat.134-135). Rich in inscriptions and advice for navigators, the terrestrial globe is a smaller-size copy of that at Versailles. The last showcase in the room contains globes of different provenance and function which exemplify the variety described in the book by the English writer Moxton. These include not only a small English-made travelling globe combining the terrestrial and the celestial spheres but also two armillaries, one of them by Coronelli himself. What exactly is an armillary? The name comes from the Latin armilla (bracelet), the sphere being made up of various separate rings set to indicate the main orbits of the celestial sphere (the meridian, the equator, tropics, etc) plus indications of the various constellations; such armillaries were used to establish stellar coordinates. The exhibition continues in Room 6 (Sala Dossali), beyond the Throne Room and the Banqueting Hall. Astral Spheres and Armillaries. From the days of remotest antiquity men have observed the stars, with civilisations such as the Babylonian, Egyptian, Greek and Arabic all developing their own systems of astronomy and astrology. 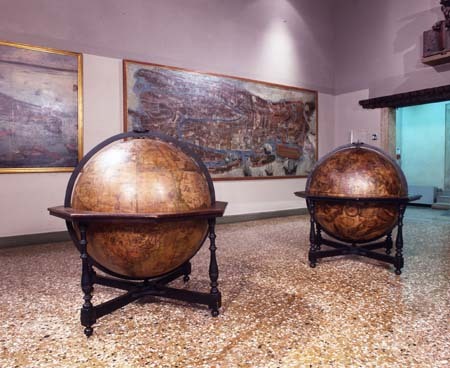 In the showcase on the right is a small porcelain copy of the famous Farnese Atlas now in the Archaeological Museum, Naples; dating from 150 AD, this is perhaps the world’s oldest extant globe. Celestial globes were also depicted on Roman coins, whilst those produced by Islamic cultures are in painstaking detail, with stars and constellations engraved by hand on the surface of the bronze. In the last showcase of the previous room we already saw armillaries, spheres made up of individual rings that could be used to determined the coordinates of the stars. However, such armillaries changed depending upon the astronomical concepts used in their construction. There are, for example, geocentric armillaries, which follow the Ptolemaic system and show the sun and planets revolving around a stationary Earth; examples can be seen in the 16th century book by Comandino in the showcase to the left. Heliocentric armillaries on the other hand followed the Copernican idea of the universe, showing the Earth and other planets rotating around the sun. When the rings have a mechanism that enables each of the planets to move at its respective speed, then the armillaries were also known as Planetaria or even Orreries (one such clockwork machine having been made for Charles Boyle, 4th Earl of Orrery). Visions of the World and the Construction of Globes. The Early Modern period saw a huge conflict between the Ptolemaic and the Copernican – the geocentric and heliocentric – systems. The books on the right expound the cosmographical and astrological ideas prevalent in the Middle Ages and contain writings by such Late Classical authors as Capella, Macrobius, Hyginus and Manilius. 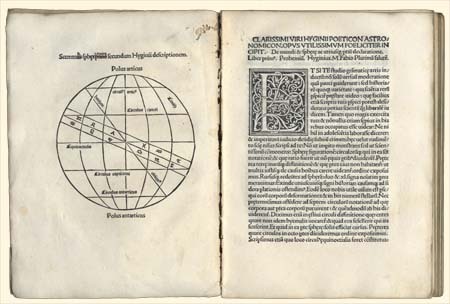 In the 12th century the astronomical treatise written by Claudius Ptolemy was translated from Arabic to Latin, with his ideas then being amply studied in the Schools of medieval Europe, particularly thanks to the work of John of Holywood. A return to a direct examination of Ptolemy’s own text during the Renaissance would lead to a radical revision of Holywood’s interpretation – for example, in the writings of the Paduan mathematician and Greek scholar, Francesco Barozzi. Closely bound up with existing traditions are the tables showing the positions and movements of the stars which were calculated in thirteenth-century Toledo for the Castilian monarch Alfonso. This material would be the basis for the study and teaching of astronomy right into the 16th century. On the walls and showcases to the left is material reflecting technical aspects of the production of globes. To produce a series of globes, the cartographical image was printed in a number of ‘lunes’, the segment bound by two meridians. These paper strips – such as those by Coronelli on display here – were then glued onto a sphere of wood or papier-mâché. The technique used would remain unchanged for centuries. In the showcase on the left are various works demonstrating the production of globes – for example, an illustration from the Encyclopédie. There are also lunes used in the manufacture of small-size celestial and terrestrial globes. The Construction of Lunar Globes and Spheres. The library contains an atmospheric display of terrestrial, celestial and lunar globes; there is even a globe of Mars. Produced in the period from the 17th to the 20th century, these globes illustrate the developments in astronomical knowledge and theory. The first printed lunar globes date from the 18th century, whilst it was in the nineteenth that scientists such as Camille Falammarion (1842-1925) first put forward precise hypotheses regarding the terrain, flora and fauna of not only Mars but also other planets. 19th century lunar globes were usually left blank on the rear side, with the space being used for information regarding size, distances etc. Only around fifty years ago, when a Soviet probe managed to photograph the dark side of the moon, were globes made that also depicted that side. When an American probe provided images of the entire dark side of the moon, the partially rectified globes were replaced by others that were complete in information. The showcase on the right contains important 16th century works which show how mathematics might be put to the service of geography; there are also series of lunes for the production of terrestrial and celestial globes. The showcase on the left contains four important works: the description of the heavens, ‘fixed stars’ and planetary system produced by Hevelius, a Danzig brewer, astronomer and inventor of the periscope; Coronelli’s project for the creation of four planispheres; his Epitome Cosmografica (1693), a short work that combines a compendium of the cleric’s geographical and cosmographical knowledge with precise information regarding the construction of his globes and the stands used to hold them; and, finally, the geographical dictionary complied by the Ferrara-born scholar Raffaello Savonarola (1713), here in the ‘pirated’ edition produced by Vincenzo Coronelli (who also supplied the engraved illustrations). Construction of Globes and Armillaries. This room contains the spectacular engraved lunes for the celestial globe produced by Giovanni Maria Cassini (1745-1824 ca. ), a member of the order of the Somaschi Fathers who had studied drawing and engraving under Piranesi. Though signed with another name, the prints for the armillaries (intended to be glued onto wooden rings) are also by Cassini. Alongside them in the showcases are French-printed lunes for a celestial globe and an armillary. Also from France – the work of the clockmaker Jacques Baradelle (1701-1776) – are the uncoloured prints of the lunes for a terrestrial and celestial globe. Treatises on the Use of the Globe. The idea that the Earth was the still centre of the Universe would persist into the 17th century. So why did the people of the time create terrestrial globes that rotated around a fixed axle? 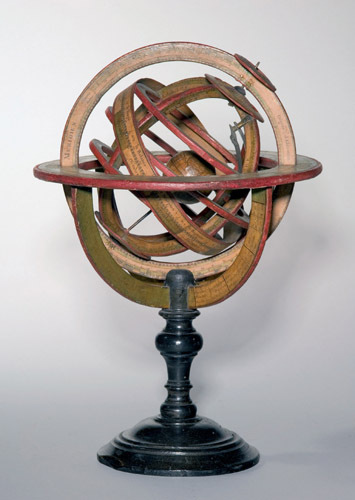 Because, marked with a meridian circle and an equator, such globes made it much easier to perform complex astronomical calculations that otherwise would have required resort to trigonometry and logarithms (as examples one might cite the calculation of differences in time zones, or of the visibility of specific stars at specific times of the year, etc). Alongside precious small-scale globes produced in 17th century Germany, this room contains two famous sixteenth-century works from the Netherlands. One is the most famous of all treatises on the use of globes. This is the work of the geometrician and mathematician Jakob Metius, who was so famous in his day that one of his works figures on the desk of Vermeer’s Astronomer (painted in 1668). In the showcase at the far end of the room is the important treatise on the harmony of the cosmos written by Andrea Cellarius, rector of the Latin school of Horn. In Room 11 are two 17th century German globes. From here the exhibition continues in Room 14. Instruments for Observing the Heavens. The central showcases contain works by various important writers, including Tycho Brahe (1546-1601), who was Europe’s most important astronomer in the period immediately before the invention of the telescope. Using instruments he himself designed, Brahe would establish the position of fixed stars and the planets; one of the pupils who assisted him in this was Willem Jansz. Blaeu, who would later become a constructor of globes and complier of atlases. Drawing upon the ideas of Classical Antiquity, Brahe proposed a model of the cosmos with the Earth at the centre and the sun rotating around it whilst serving as the centre of rotation for the other planets. The Catholic Church of the day considered this geocentric system to be acceptable, whilst it would launch bitter attacks on the heliocentric theses put forward by Copernicus, Kepler and Galileo. The six planispheres are the work of the German engraver and printer Christoph Weigel the Elder (1654-1725). Originally bound together in a volume for use by teachers and travellers, the plates are produced with great artistic skill and care for detail. In the showcase on the right are printed works and globes produced in 17th and 18th century Germany. The books illustrate how globes might be used to solve various problems – for example, the calculation of the amount of daylight at a specific latitude on a specific day of the year. The globes themselves are examples of the rich work produced in Nuremberg, which excelled in such manufacture throughout the eighteenth century. The quality of its products is clear when compared with that of the globes being produced in France around the same time. The two showcases on the left contain further pieces from France and Germany. 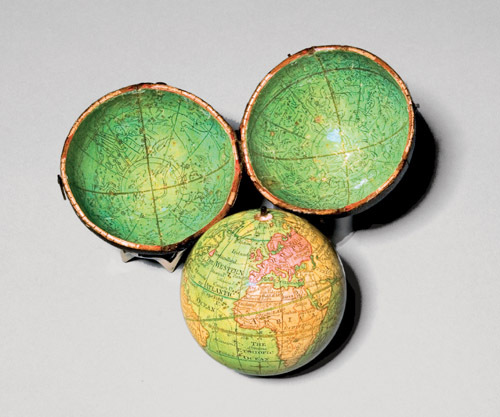 These show how, from the 18th century onwards, mass-produced globes became a presence throughout Europe. Passing beyond rooms 15 and 16 (the Correr Armoury), one comes to rooms 17 and 18, where the exhibition continues. Mass-production of Globes in the 18th and 19th century. The showcase along the right of the corridor show the fine artistic standard of the work produced in German-speaking areas – for example, Schledel’s 16th century Cronica Universalis and the sheets produced by the 17th century engraver Eimmart. The material in the room itself illustrates the type of mass-produced globes that would become widespread in Europe from the 18th century inwards. After the French and German globes in the previous room, one can here see globes from Sweden and, above all, England. A great maritime power, England was undoubtedly the most technologically advanced nation in 18th century Europe and thus played a preeminent role in the production of globes. Often these English products were innovative not only in format but also in methods of manufacture and distribution. From Sanudio to Coronelli. Changes in the Globes. 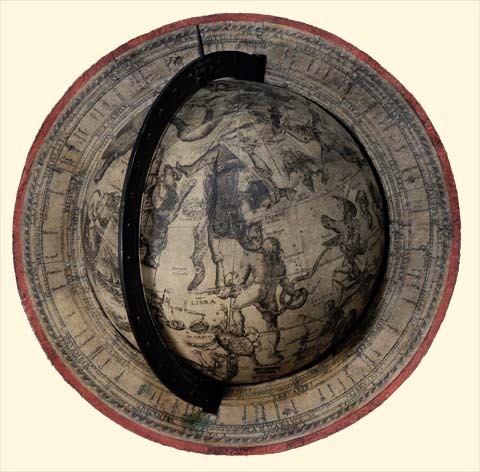 An exhibit of fundamental importance is the globe produced by the Venetian geographer Livio Sanudo (1520-1576). Long thought lost but recently identified during preparation for this exhibition, this is one of the biggest globes produced in the 16th century; that on display is the only extant example of the printed lunes actually mounted on a sphere. Alongside this key historical artefact, there are other globes of great interest: on the left is a pair of celestial/terrestrial globes by Willem Blaeu, with a large terrestrial globe by Coronelli to the right; along the walls are precious pairs of smaller globes, one pair by Blaeu and one by Giovanni Maria Cassini. The large terrestrial globes by such figures as Sanudo, Blaeu and Coronelli date from different periods and thus make it possible to compare the respective geographical knowledge of the day. At the time of the great voyages of discovery, Europe was continually receiving new and more precise information regarding coastlines and land formations, and thus within only a few years or decades a globe could be rendered entirely obsolete. This naturally increased the demand for up-to-date globes. The state of knowledge regarding continents and seas can nowadays be used in dating specific globes and maps even when the illustrations (perhaps more concerned with artistic quality) are neither signed nor dated. For example, the continent of South America reaching as far down as Tierra del Fuego (Straits of Magellan) was, from around 1618, shifted further southwards by Schouten and Le Maire. Similarly, something approximating the western coasts of Australia, Tasmania and New Zealand makes its first appearance in globes after the voyages of Abel Tasman (1643), whilst the island of Tasmania was actually discovered around 1800 (Flinders). And in the northern hemisphere, it was not until around 1900 that the northern coasts of Greenland were explored.